No corner of the marine market has benefitted more from advancements in electronics than fishermen. The desire for better fishfinding technology has in many ways driven the rapid evolution of electronics for all boaters. Fifty-something anglers, such as myself, have witnessed a parade of “breakthroughs,” beginning with simple electronic flashers, then paper graphs, monochrome CRT echosounders, color CRTs and finally high-definition color LCDs. These all pale in comparison to the advances of the last five years. Today, fishermen can electronically detect fish hiding under docks on either side of the boat; see submerged trees, reefs or wrecks in near-photographic detail; and with some practice, identify the species of fish targets on the display. And these examples just scratch the surface, so to speak, of what the latest technology can show you below. It’s a great time to be a fisherman, particularly if you’re a technology buff who enjoys tinkering and experimenting. However, if you’re like me — still trying to learn how to program that dusty old VCR — the amount of new echosounder technology out there can be intimidating. 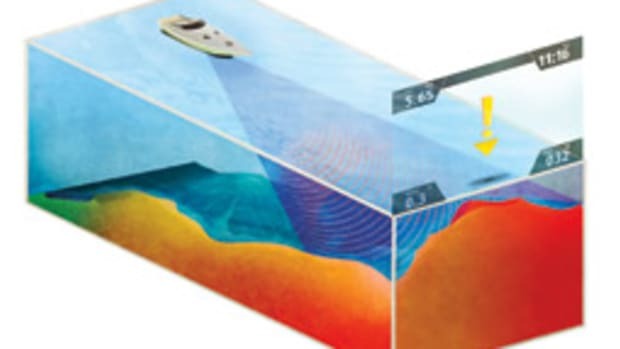 All echosounders, including today’s most sophisticated devices, work at their core level on basic principles of sonar (sound navigation and ranging). A transceiver emits a sonic pulse through the water via a transducer and “listens” for the pulse to return off the bottom, structures or suspended objects. Just how they do this, and the way these machines process and display that information, can vary greatly. The recent development of CHIRP transducer technology and its widespread adoption by sounder manufacturers has been a game-changer. CHIRP (which stands for compressed high-intensity radar pulse) sounders emit a pulse that crosses a wide range of frequencies from low to high all at once. Sophisticated processors separate the returns from these pulses and decipher the information to create a very detailed image of bottom, structures and suspended fish. “Learning” is the operative term when it comes to getting the most out of new technology like CHIRP, advises Mitchell, who admits to being intimidated at first. Capt. Mark Maus, who runs the latest Simrad NSS MFDs with CHIRP/SideScan/StructureScan sounder modules on both of his tournament-rigged boats, agrees. “The more you use your system, the more you gain confidence in what you’re seeing,” says Maus. He has outfitted his 36-foot Yellowfin center console, which he uses for offshore runs, with two 16-inch displays; his multipurpose 24-foot Yellowfin center console boasts twin 12-inch Simrad MFDs. Maus says learning this new technology has, in particular, changed the way he fishes in deep water. “CHIRP comes into play big time when I’m swordfishing,” he says. “I can get into 1,000 to 1,200 feet of water and read the bottom clearly. I can pick up squid balls and bait at 800 feet and then adjust my baits to that level.” As any avid angler can attest, positioning your bait in close proximity to game fish is an excellent first step. Scanning sounder technology is another hotbed of recent product development — taking echo- location and literally turning it on its side. Leading brands like Lowrance, Simrad, Garmin, Humminbird and Raymarine offer ultra-sideways/downward/forward scanning capabilities under a range of trade names. Special transducers emit an ultra-high-frequency, fan-shaped beam in whatever direction they’re pointed. Used in combination with straight-down sounding (CHIRP or otherwise), this technology allows fishermen to keep an eye on what’s underneath the boat while searching waters around the boat. Because this is essentially a cone of sound pointed sideways, there are limits to how deep side scanning can read bottom — generally about 125 feet. Garmin and Raymarine claim to have emerging technology capable of much better in terms of deep-water performance, and it wouldn’t be surprising to see other manufacturers follow suit. 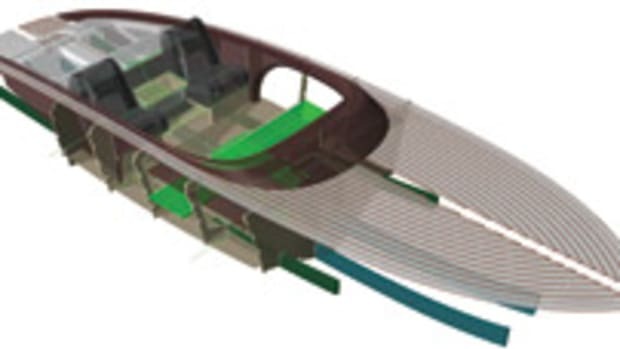 Side scanning can also be very effective in offshore waters to pick up bait and game fish suspended in the water column, or orienting to floating or fixed structures. “Using SideScan and StructureScan is almost cheating,” quips Maus, referring to his Simrad NSS black-box sounders. “When I’m fishing the upper Gulf on my 36, I can side-scan an oil rig to see if there is any bait on the that rig — and what leg it’s on. The bait will usually sit on one corner of the rig, facing into the current. Now I know what’s there and where it is instead of guessing, and that saves me time and effort. A fisherman “trolling” for a new echosounder is faced with wealth of new technology — most of it available in black-box or module sounders designed to be integrated with one or more MFDs. 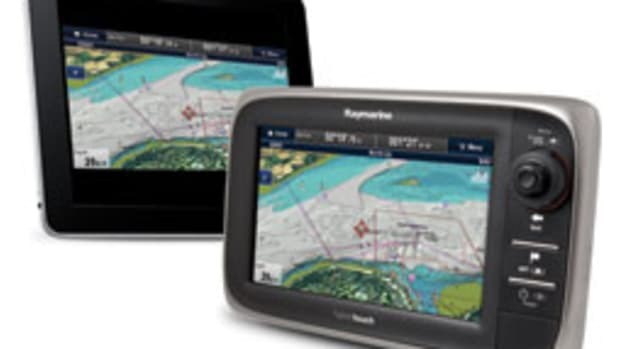 These solutions allow one display to share navigation/chart data, radar, thermal-imaging cameras, entertainment options and more, along with sounding information. There are many advantages to the MFD sounder approach.The power and level of control these systems literally put at your fingertips is undeniable. Zooming displays in or out with your fingers. Scrolling a sounder display back to get another look at a bottom bump you passed over, then dropping a waypoint to circle back to it. 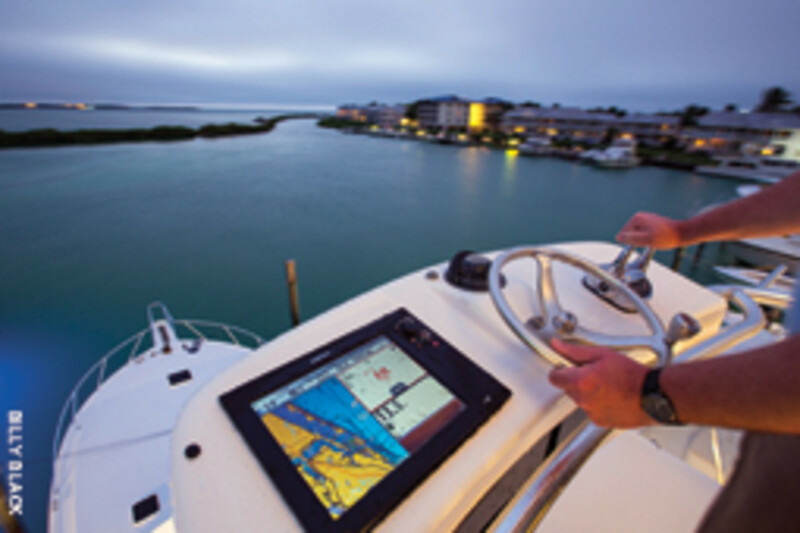 However, there can be some real-world challenges to using touchscreen LCDs on fishing boats. If you’re ever tried to dial an iPhone while riding a pogo stick, you know how I feel trying to operate a touchscreen in rough chop. It’s also a rare occasion when my hands aren’t covered with fish scales or squid ink, neither of which looks very good finger-painted across a color sounder screen. If you’re thinking that I’m an old-fashioned, knob-and-dial-loving grump, you’re probably right. 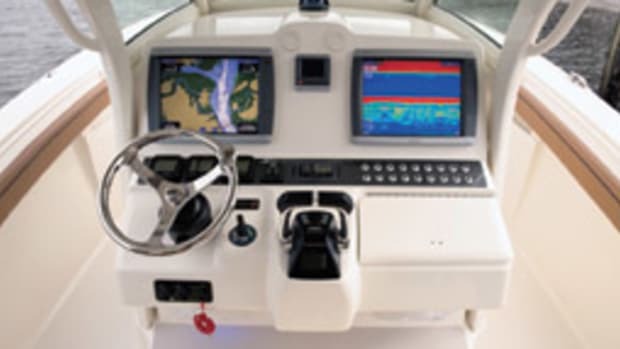 Manufacturers also recognize that touchscreen technology may not be the best option for every fisherman and every style of boat. Most of the major brands offer systems with the ability to control the machine’s functions either by touchscreen, traditional keypad or some combination of both. 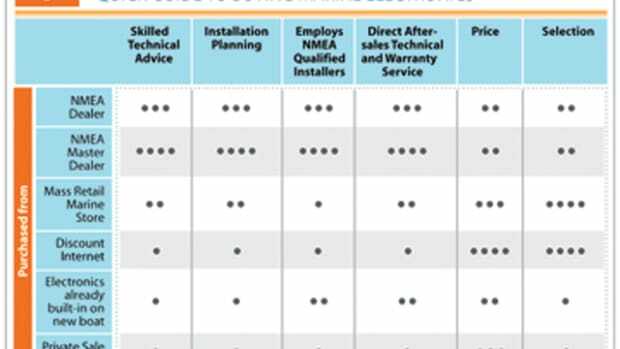 The inevitable drive toward integrated systems and MFDs hasn’t completely done away with standalone, dedicated sounders. I find it telling that commercial fishermen — those whose livelihoods depend upon finding and catching fish — are the ones who still use this technology. Their primary goal is to do a more efficient job of finding and catching target fish in familiar waters, and the technology in dedicated echosounders has evolved to help them succeed, with features such as digital signal processing to enhance target separation, frequency tuning and “Bottom Discrimination” (a Furuno feature that shows/predicts bottom composition with graphic icons). Furuno and SI-TEX/Koden — Japanese manufacturers with strong roots in commercial fishing — continue to provide and innovate dedicated sounders. They’re proven, familiar, affordable (compared to replacing an entire electronics package) and give fishermen a dedicated processor/display for what many think is the single most important need: finding fish. 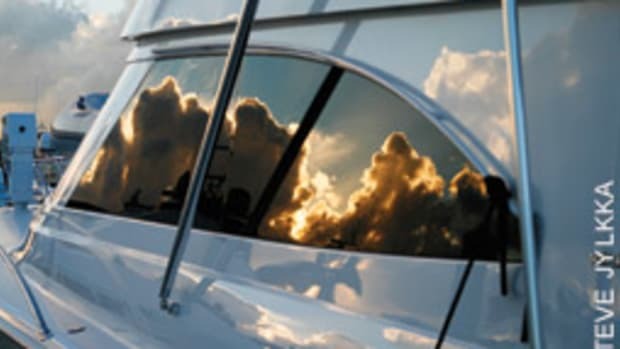 With so much new technology coming at us so quickly it’s easy to see how the average boater can be overwhelmed by choices. The best advice I can offer is to seek counsel away from the sales noise. 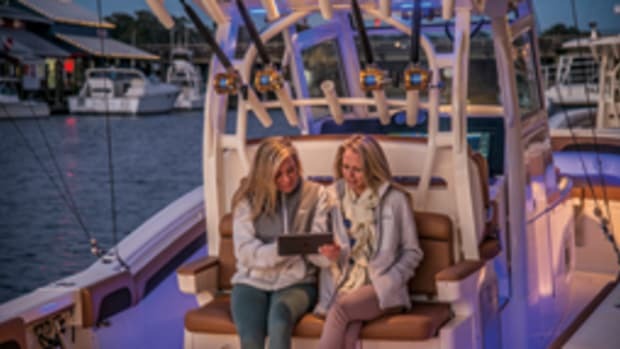 Search some message boards, ask a trusted friend or, better yet, walk the docks at your local marina and talk with actual users.The common theme from pros is that, while technology has changed, the job of the fisherman essentially hasn’t. Yes, you can see what’s beneath and around you with greater detail and precision. However, you still need to interpret what you’re seeing and apply your skills as a captain and angler to verify through success what you actually saw on the screen. The challenge of finding fish and fooling them into biting our baits and lures has driven men to the sea — and driven many of us crazy — for generations. 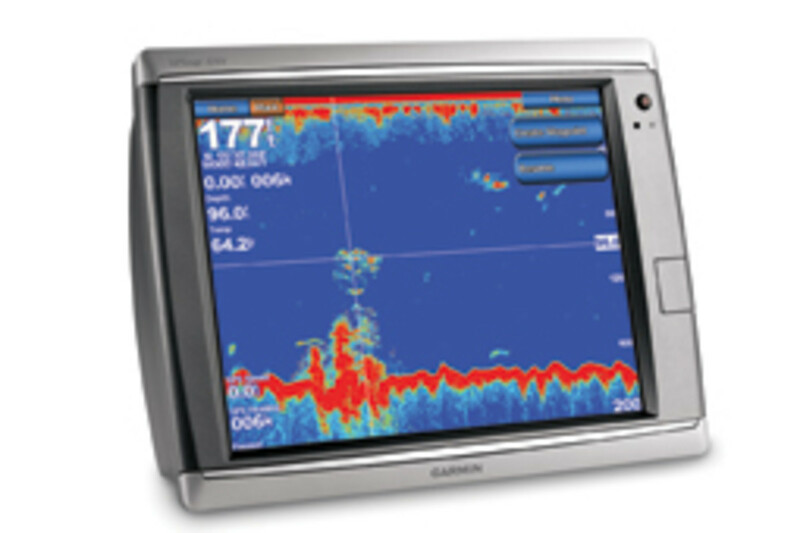 Today’s echosounder technology gives anglers more information than ever with which to work. But it will never be able completely outsmart our pea-brained adversary.